WE HAVE A WINNER..... Congratulations to coljim!!!!! A New Sweepstakes will start on Tuesday 12/09/08 and it will be a good one. 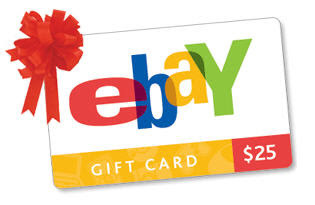 http://www.asapsellsit.com/, NYC's #1 ebaY consignment service is giving away a $25.00 ebaY Gift Card to 1 lucky winner. If you're like me you can spend hours on ebaY browsing through listings. Use this card to buy that old toy that you had as a kid, maybe find a good deal on a holiday gift for that someone special, or heck even sell it on ebaY. ebaY gift cards generally sell for more than there actual value on ebaY. Or maybe you want to spend it on one of my items. *Just enter your e-mail address in the comment section below. Please note to use this gift card you must have an ebaY account and a PayPal account. *For an extra entry list your favorite car company or car model below your e-mail address. It will just help me out in doing some research on the Car Hats that I have listed on ebaY. -Gift Card winner will be posted & e-mailed on Monday Dec 8th, 2008!!! -Giveaway starts Monday Nov.17 2008 at 12:00am and ends Sunday night Dec. 7th @ 11:59pm. -1 entry per e-mail address. -Every few weeks we will be giving away a different item and the one right before Christmas will be the biggest. So come back to my eBayBlog often. Honda Odyssey or Element - both make great dogmobiles! Great to win at this time of the year! Ford Fusion, fun and sporty. Saturn Sky or Saturn Aura - Saturn has a great line of cars! I love my Hyundai Elantra. I love my Hyundai Santa Fe! I'm partial to Chevrolet, but I've wanted a Mazda3 for some time now. flyingnunn@azci.net -- Thanks for the opportunity. My favorite car is the Dodge Charger. My favorite car is my 2005 Ford Escape. I love Ebay!! I did over 50% of my Christmas shopping there. As for my favorite car...I'd go with the classics. There are two that I dream of owning some day. Either a '64 Mustang or a '57 Thunderbird. VW GTI - I'm in love with this car! Thanks for the very nice giveaway! 1964 Ford Mustang! Love those old Mustangs! fav car is a dodge ram megacab! Honda Odyssey as dog-mobile. LOL at first response. I agree. Thanks so much for the chance! I am in love with Ebay! ooh nice prize!! I love shopping on ebay! I love Ebay! I have purchased so many items and gotten some great deals on many different kinds of products. You have a very cool website! I give you a lot of credit for being an entrepreneur and starting your own eBay business. I hope it continues to go well for you, and I am a huge Ebay supporter. Thank you so much for the opportunity to enter. Happy Holidays! My e-mail address is in my blogger profile. I love Ebay and have met some wonderful sellers.your site id nice I wish you the greatest success. My fav suv is a Lexus. I love to buy and sale on ebay. My favorite car model is a Monte Carlo. I love the Aptera - you have to check it out! my car is a Jaguar XType. Pontiac Gran Prix, I have 1, my Mother-in-Law has one and my parents have one...all different years and each of us love them. Great control/driving, have had no problems, fair gas mileage. i always wanted an mg.great giveaway. How about "life" as in this is life. Volkswagon Passat GL is our ol'standby here. Unlikely we will buy another unless the auto industry comes out with an affordable hybrid. I also use public transportation every chance I get...saves gas and adds variety to my daily life. You have to think about Saturn! Might go out of business....extremely loyal owners...... prob could sell a few hats. I love my VUE. Favorite vehicle is the Saab 9-3 Turbo! my favorite car company is Ford. I did a little Christmas shopping on Ebay today and got 5 great shirts for .99 each! Now, that's a deal. My favorite car is the Kia Sorrento. It is affordable and drives great and is also comfortable. You have plenty of room for anything and everything. I have a Sportage that I love but my next one will be the newer Sorrento model. I like the Toyota Prius, sure would be great at fillups. I have an old chevy blazer that has always been good to me, so I still love it. Thanks for the giveaway! I come from a Ford family. Chevys here, but they might not be made much longer. Thanks for having the contest. I can always find something I love on ebay! Toyota seem to have the most reliable cars I've seen. lanemarinab@aol.com Honda Accord! Thank you for the Giveaway! Toyota is probably my favorite overall for quality and looks. I like sporty cars in general and also like classic American cars. You can find my address on my blog. Anything by Honda is great.